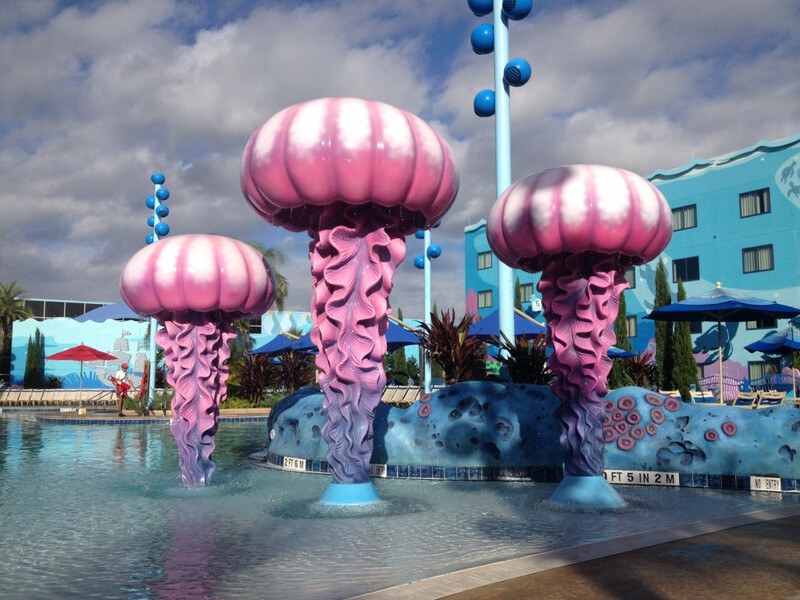 I spent three nights with my daughter at the Art of Animation Resort in Disney World and though I had high expectations, this place totally blew me away! 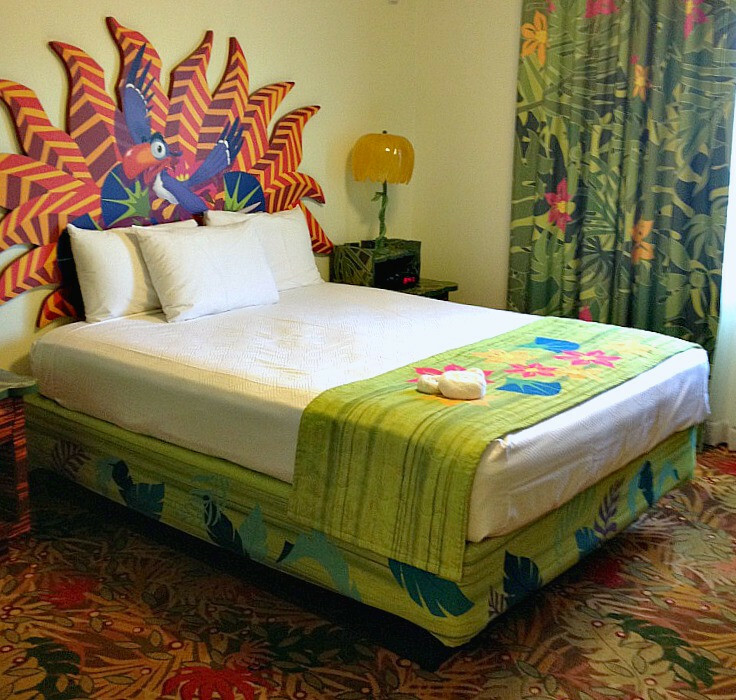 I’ll start my in-depth Disney Art of Animation resort review an overview of the resort and its amenities, followed by reviews of the family suites and standard rooms. First, here is a map of the Art of Animation. 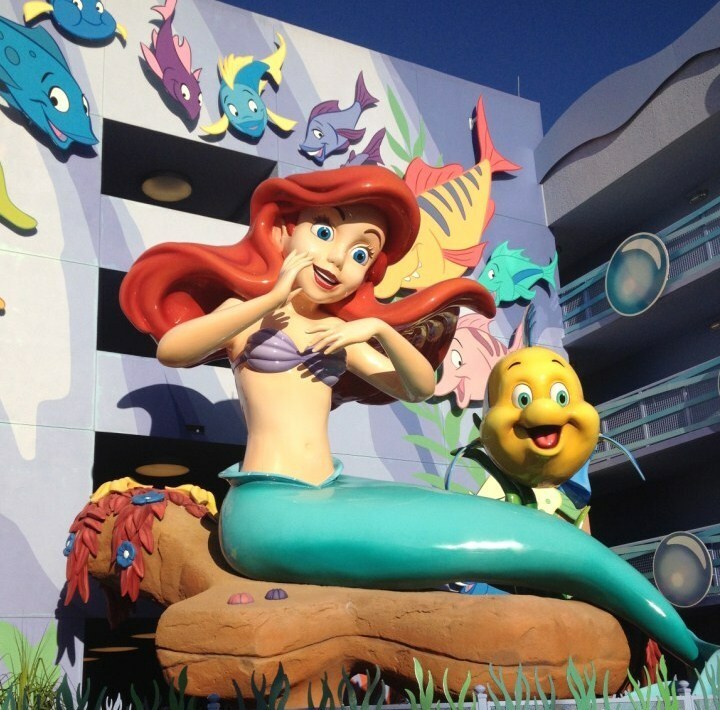 The resort is divided into four different sections, each representing a Disney animated classic. 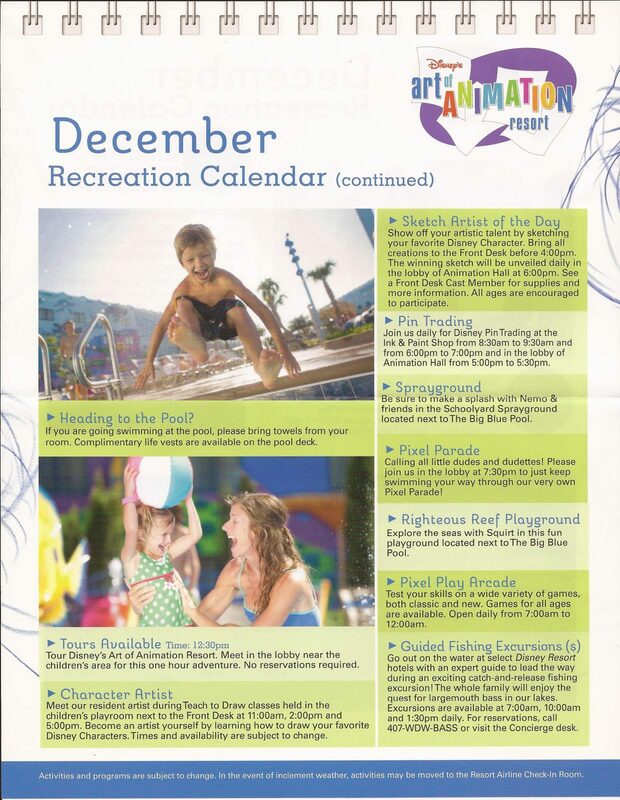 Disney Art of Animation is considered a “value” resort which means it offers the lowest nightly rates of the Disney resorts and the least in terms of luxuries and amenities. 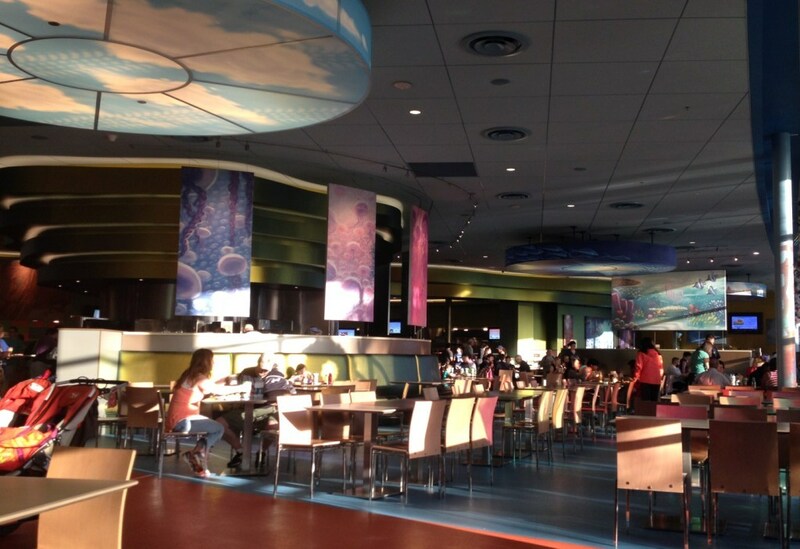 Animation Hall is the main building that houses the check-in and concierge desks, food court, gift shop, etc. 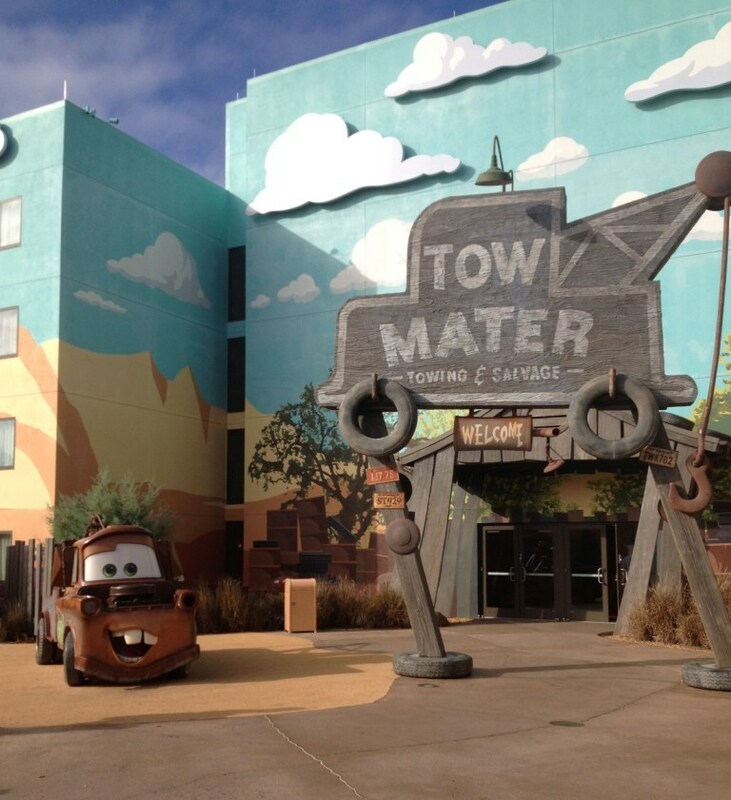 The three sections closest to Animation Hall offer ‘family suites” and are themed around the movies The Lion King, Finding Nemo, and Cars. 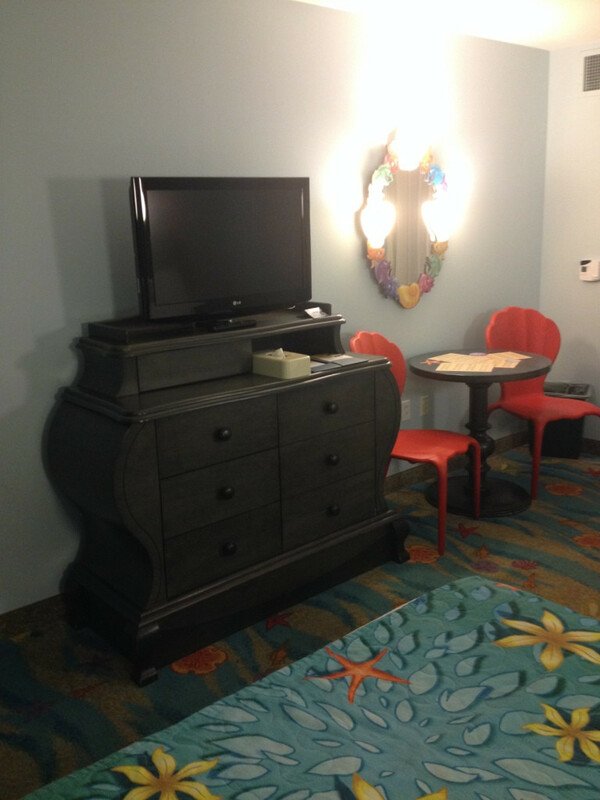 These family suites start at about $300/night (the rack rate without any discounts). The section farthest away from Animation Hall offers standard hotel rooms. 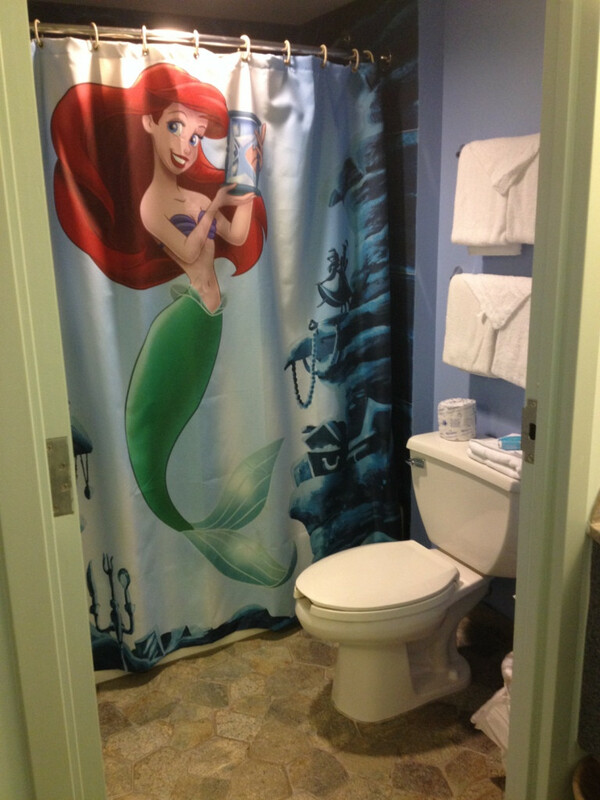 It is themed around The Little Mermaid. 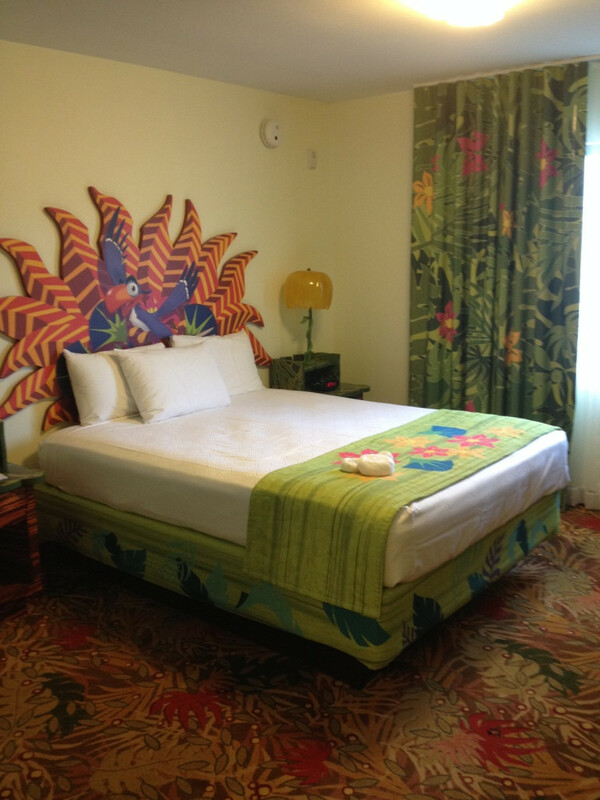 Standard rooms start at $140/night and sleep four, while family suites start at about $300/night and sleep up to six. Outside of the front of Animation Hall are the bus stops. 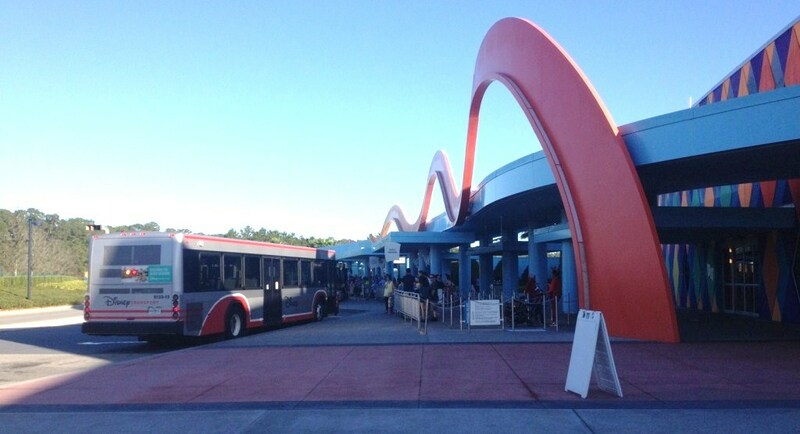 One feature that sets the Art of Animation apart from other Value resorts is the bus service. This resort has both dedicated bus service (meaning buses only stop at Art of Animation and aren’t shared by any other resort) and a nice covered waiting area for the bus service. 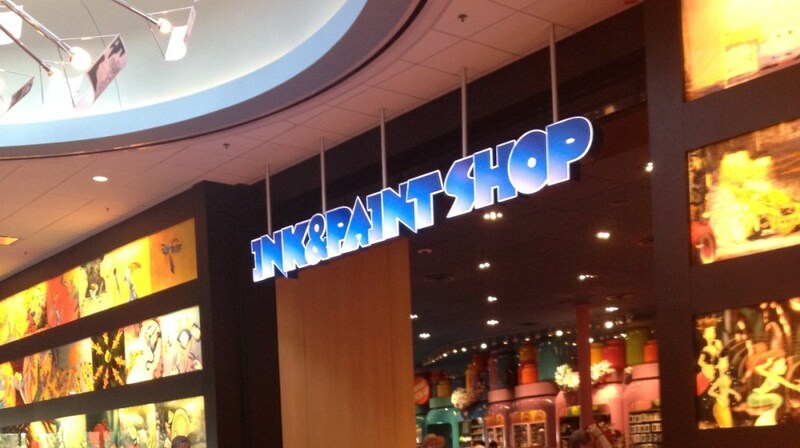 Back inside Animation Hall, you will find an arcade, the gift shop (Ink & Paint Shop) and the Landscape of Flavors food court. While the gift shop is nothing to write home about (your standard Disney resort gift shop), the food court is one of the best quick service restaurants I’ve eaten at in Disney World. The variety was incredible and the food was fresh and tasty. Plus, house-made gelato, create-your-own salad, pasta and burger stations, AND a beautiful open kitchen. 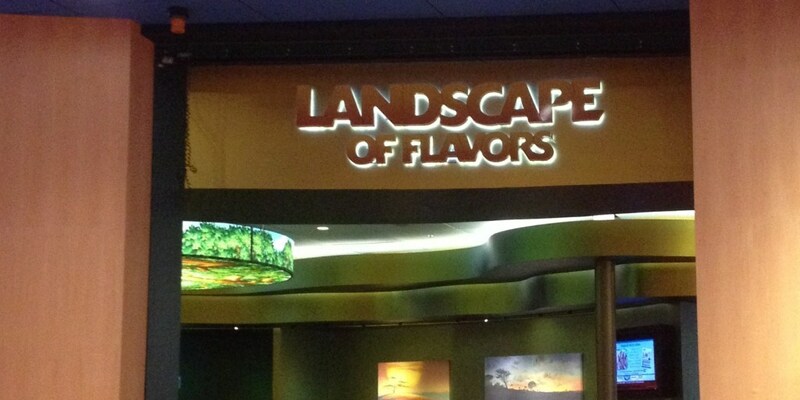 Check out my full review of Landscape of Flavors here! 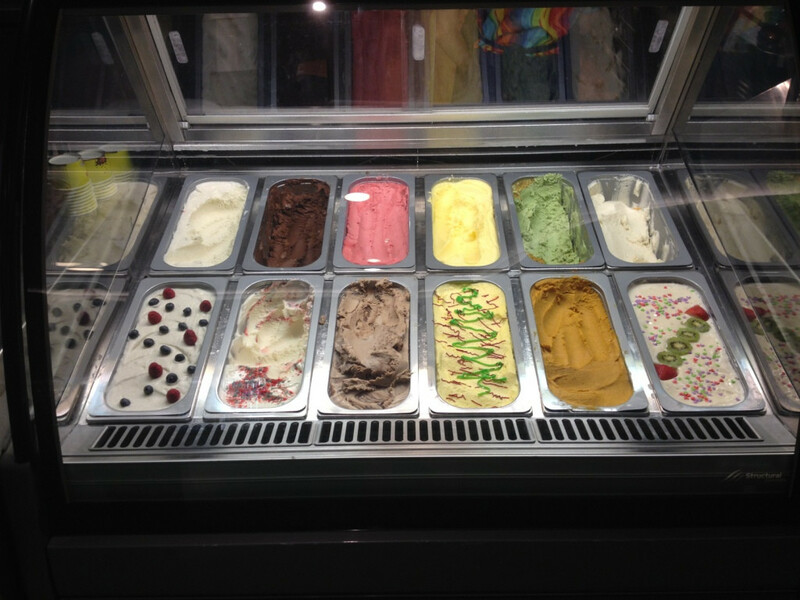 Don’t miss the house-made gelato! 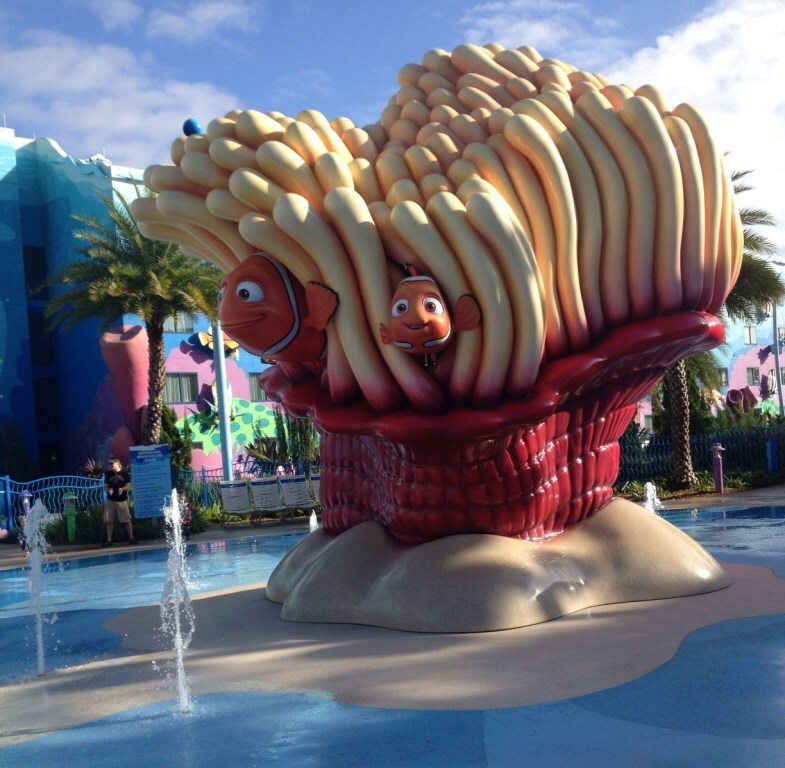 The resort features three unique pools, including a huge zero-entry feature pool themed around Finding Nemo. 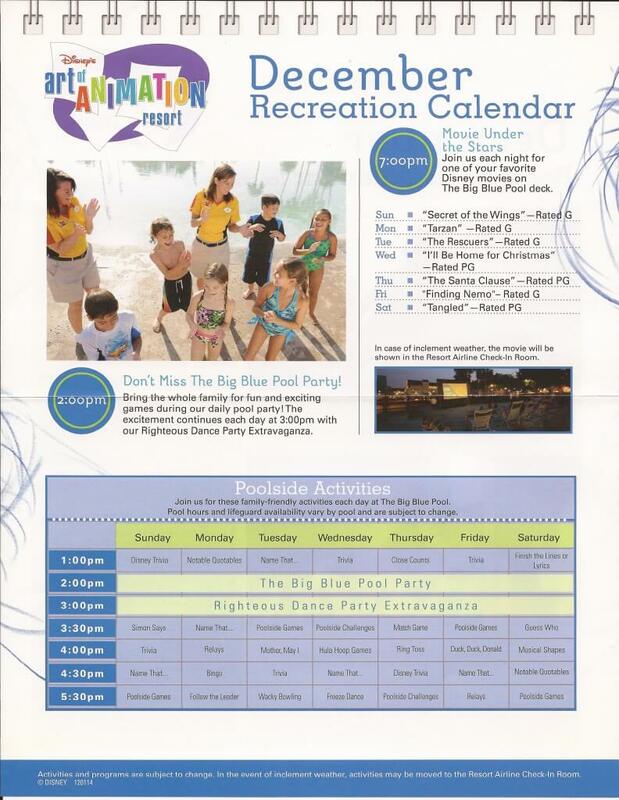 “The Big Blue Pool” is a big draw for the resort. 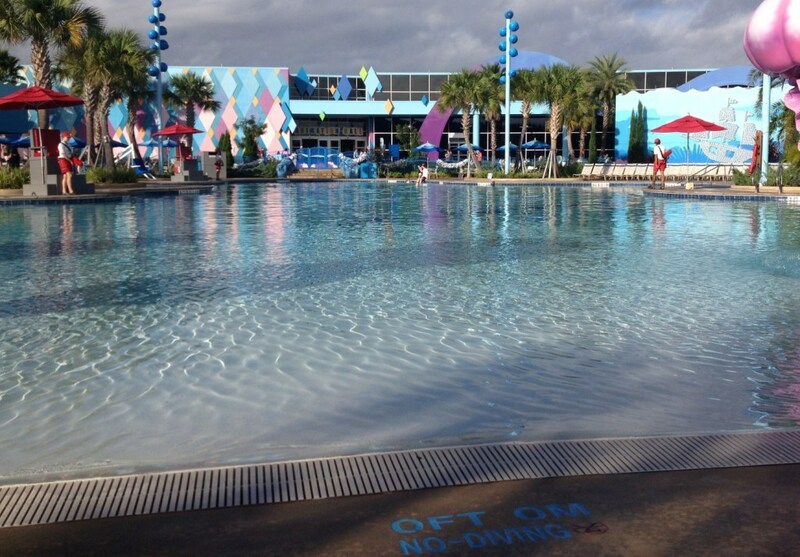 It is the largest pool on Disney property, the only zero-entry pool at any Value resort, and even plays music from Finding Nemo under the water! 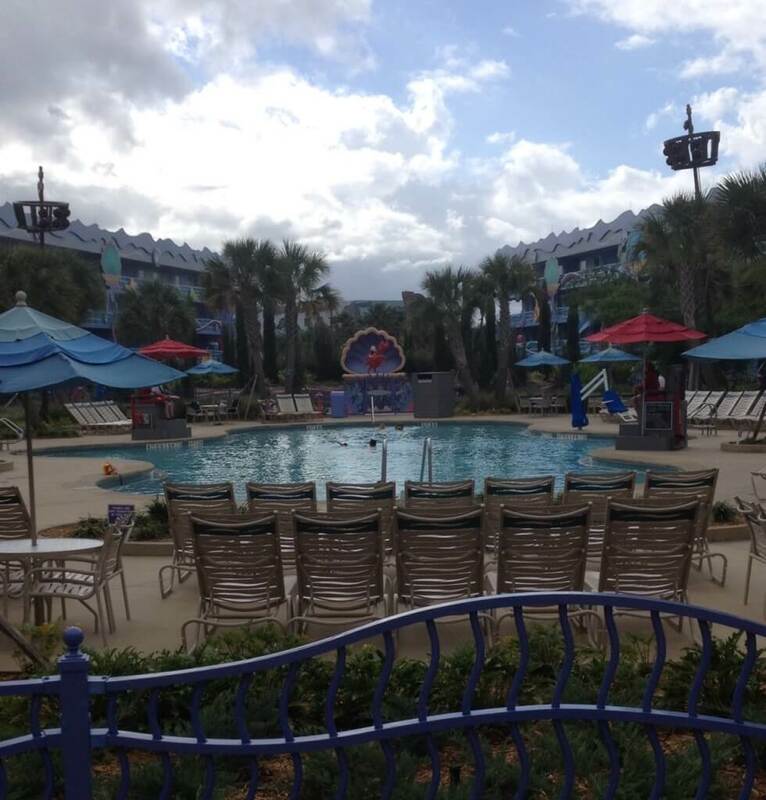 The pool area is completely surrounded by a gate and guests use their Magic Bands to gain entrance to the pool. While there is no traditional kiddie pool, there is a large splash area next to the main pool with puddles and fountains for the little ones to play in. 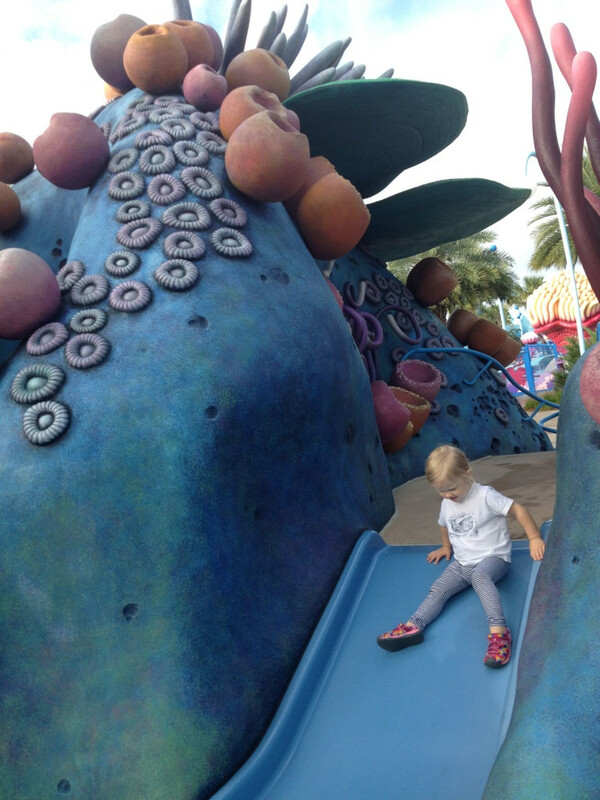 The resort’s playground is found right next to the splash area and includes slides and tunnels all made to look like they are part of a coral reef. We had so much fun at the pool and on the playground! Every day there are recreation offerings at and around the feature pool to help entertain your own little squirts. Poolside activities start at 1 pm each day and include games, trivia, prizes and a dance party. Every night you can watch a “Movie Under the Stars” on a huge inflatable screen on the pool deck. Also in the pool area is the resort’s pool bar, “The Drop Off”. 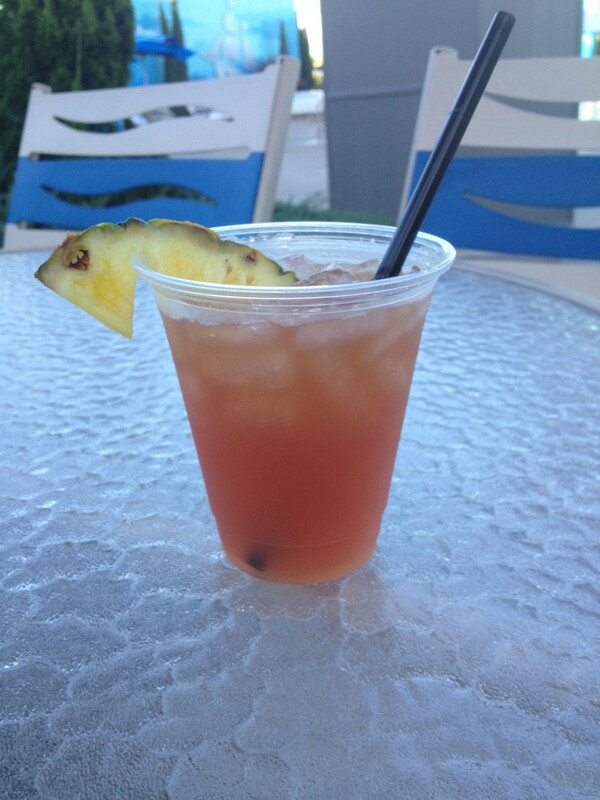 I tried a Mai Tai (all in the name of research!) and it was awesome. 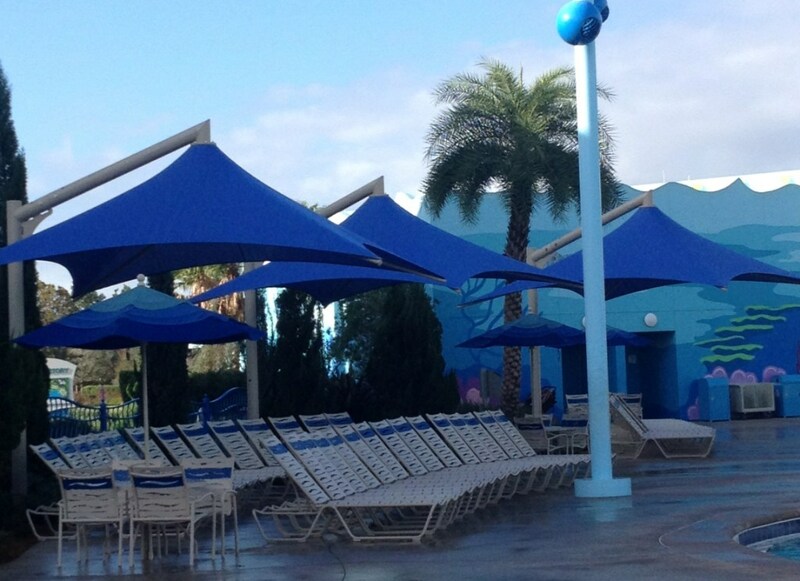 Laundry facilities, changing rooms and these wonderful HUGE umbrellas can be found in the pool area. Shade is something I seek out in pool areas and Art of Animation sets itself apart from the other value resorts because it actually offers some shade by the pool. Thank goodness someone realized that kids (and some fair-skinned mamas like ME) can’t spend all afternoon in the sun and thought up these great umbrella-things for the pool area. The Cars and Little Mermaid sections of the resort offer their own smaller pools. 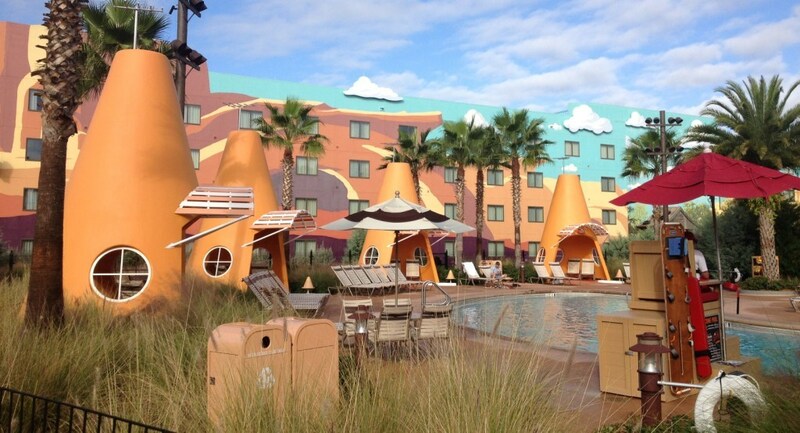 They were also incredibly themed, right down to the cozy cones cabanas. These are a great option for a quick swim if your room is far from the main pool (which some definitely are) or if you like a less-crowded pool experience. And last here are some pictures of the amazing grounds of the resort. The attention to detail is incredible here, especially with the way the landscaping helps sets the mood of each distinct area. 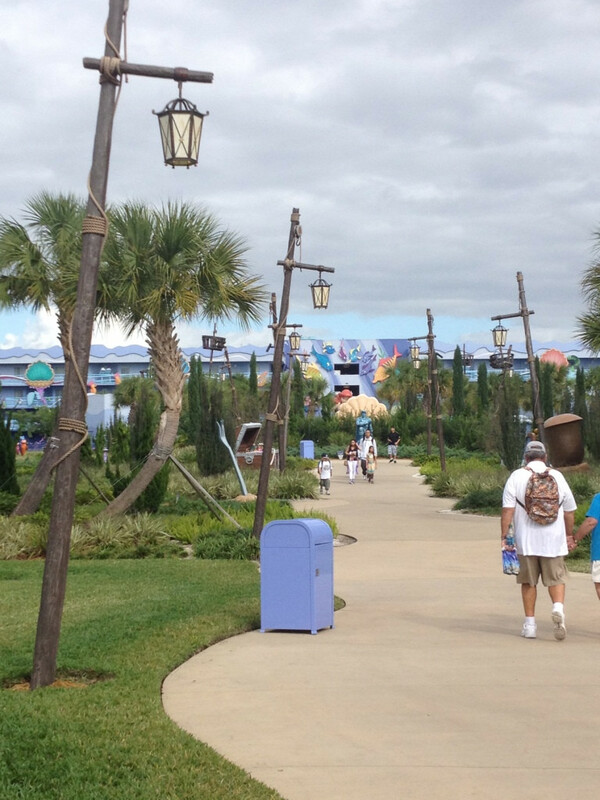 I especially love the plants in the Little Mermaid area that look as if they are growing on the sea floor and the desert rocks and plants in the Cars area. 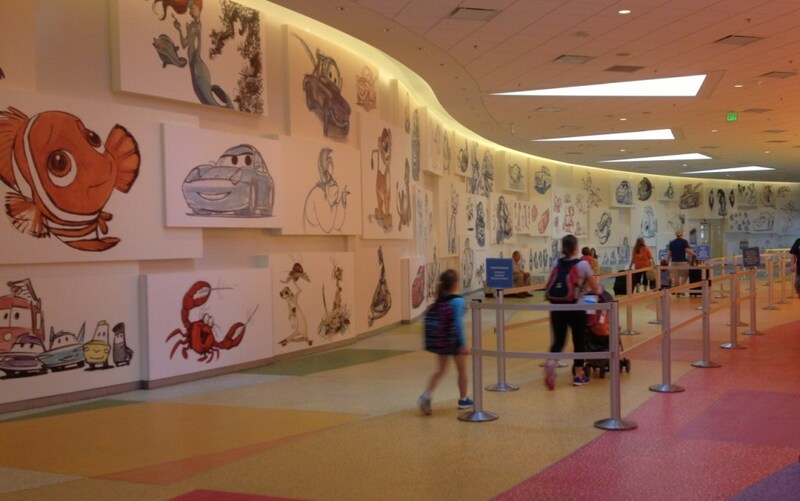 I can’t say anything critical of the grounds and public areas of the Art of Animation. It was immaculately clean. It is easy to get around (except for the long hike to the Little Mermaid rooms) and the theming is completely incredible. 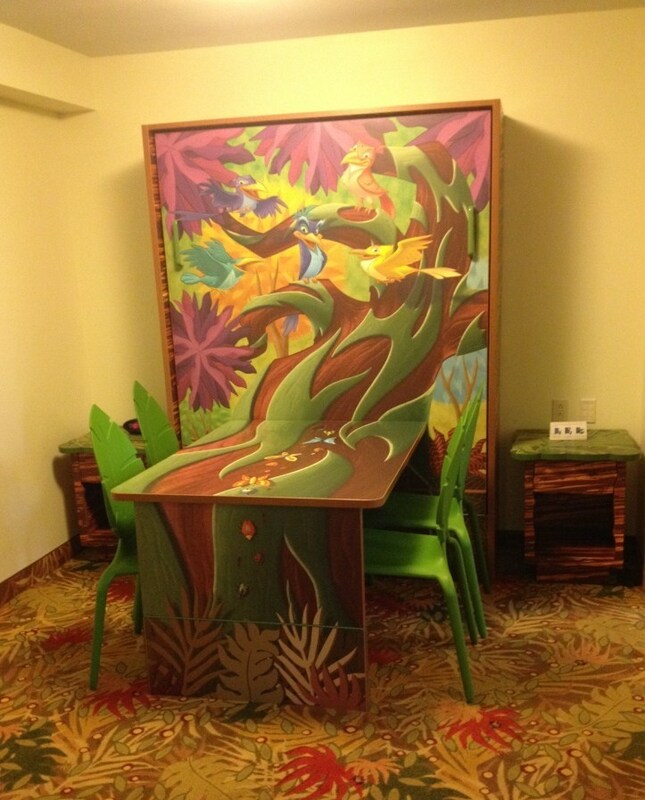 When my daughter and I stayed at the Art of Animation in December we were treated to a tour of one of the resort’s Family Suites. I didn’t know what to expect in terms of the layout or size of these suites, though I did know they were supposed to sleep up to six and have two full bathrooms. 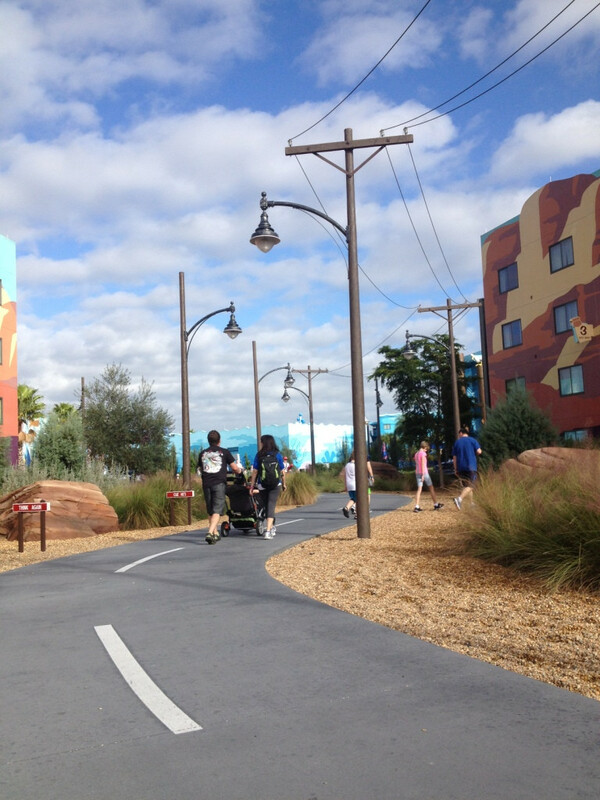 The Family Suites are housed in the buildings closest to Animation Hall, the main building of the resort. 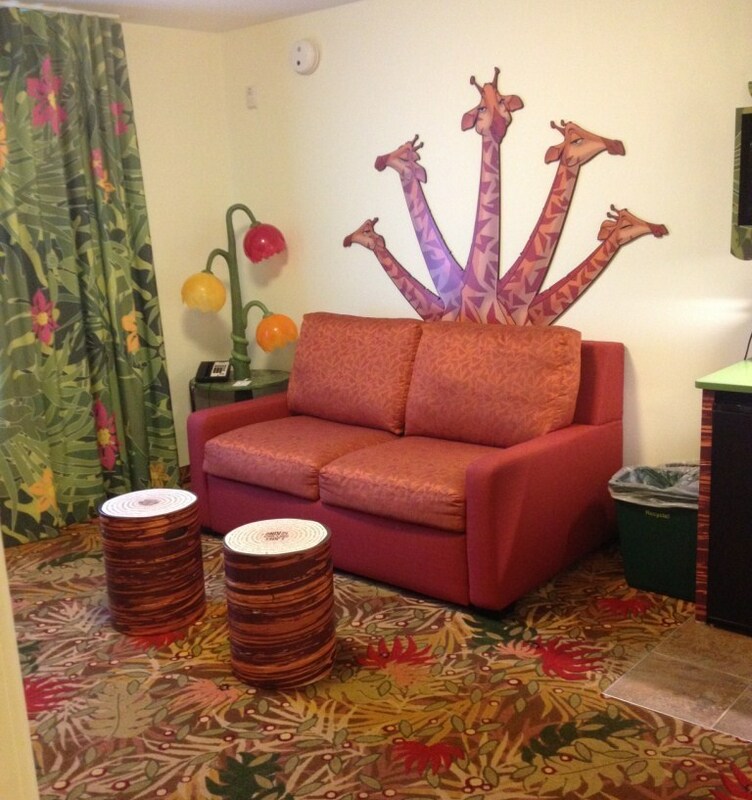 There are three themed areas of the family suites: Cars, Finding Nemo and The Lion King. 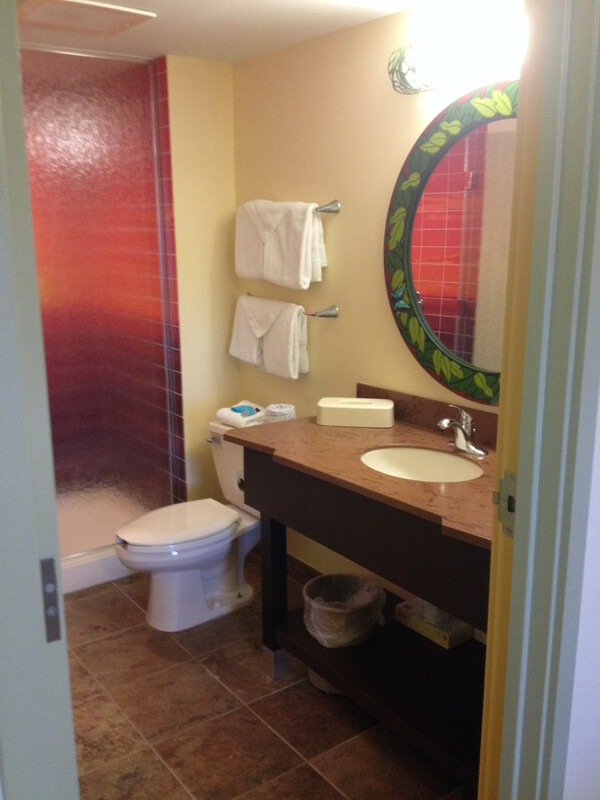 Unlike all other Value Resort rooms, these open up to an interior hallway instead of directly outside. The main entrances to each building put you right at the elevators for the upper floors. I’ll apologize right now for the low photo quality. I got my new camera right after this trip so future photos will be better! The first room you encounter when you enter the suite is a dining room with a table and four chairs. The coolest feature of these suites is that the table is a full-size Murphy bed. Weston (the cast member who showed us the room) demonstrated how easy it was to pull the bed down using a handle on the side of the unit. On the right wall of the dining room is the entrance to the first bathroom. 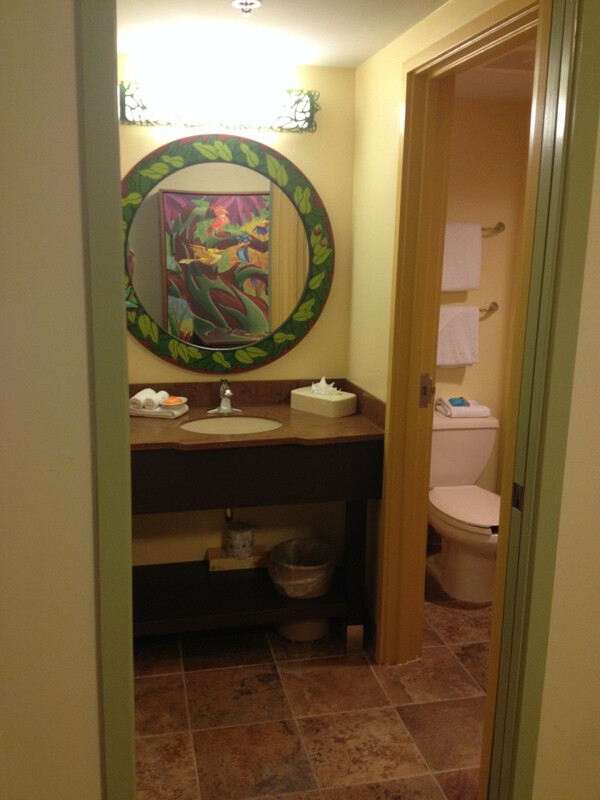 I especially liked the light fixtures and tile work, which reminded me of the rooms at Animal Kingdom Lodge. Beyond the dining room is a living room with a full-size pull-out sofa bed, TV, a small kitchenette, additional seating and some nice storage. 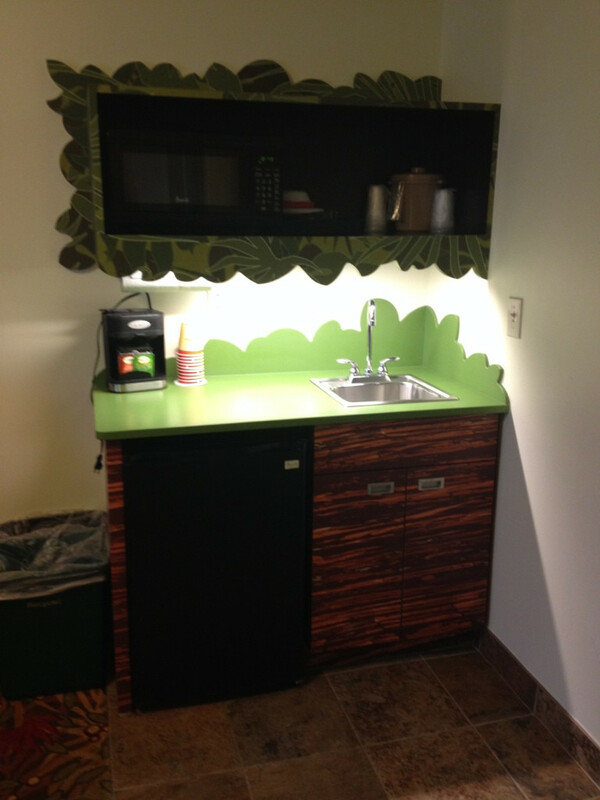 The kitchenette includes a microwave, mini-fridge, sink and 2-cup coffee maker. The master bedroom is to the left of the dining room and includes a queen bed, another TV and more storage. I thought there would be plenty of room to move around in there even with two people in the room. And last, there is a second bathroom off of the master bedroom. It has a shower (no bathtub) and the same lovely tile work as the other bathroom. 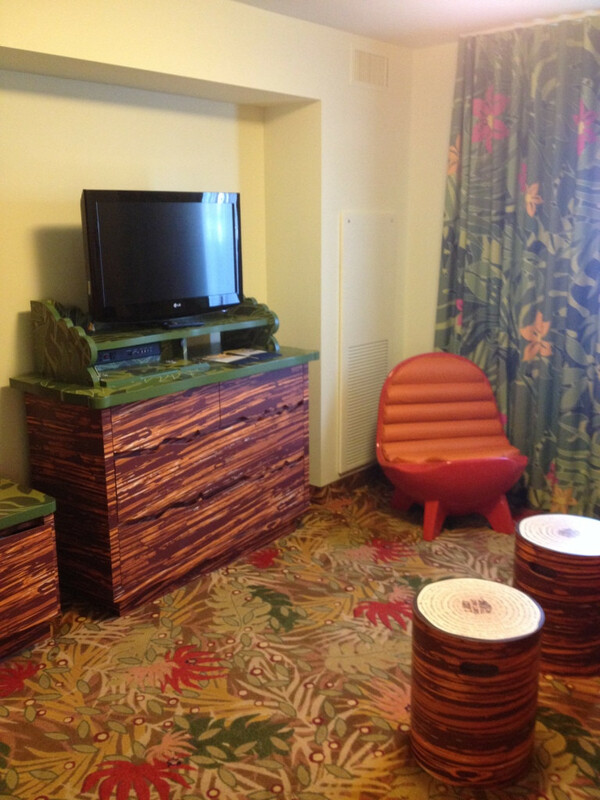 Overall, I thought the suite was spacious, well thought-out and had great theming. That said, you should probably really like the movie in which you will be immersed since the theme is hard to escape! I think the suite would be the perfect fit for a family with several kids who want more room (and another bathroom… hallelujah) than a standard hotel room. You can’t do much cooking in the kitchenette, so if you want to make meals in your room you will need to look into a different room type, such as 1 Bedroom Villa at a Deluxe Resort. The main drawback to these rooms is the price. 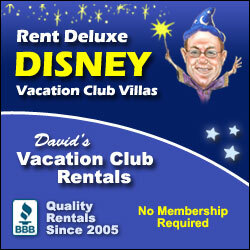 They are expensive even by Disney standards with rooms starting at $300 per night. 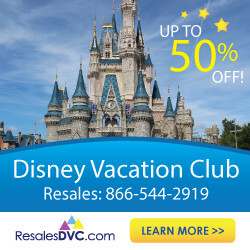 You could get connecting rooms at Pop Century or an All-Star resort and have the same amount of room for about $100 less per night. You would be giving up the living room area but gaining two additional beds. 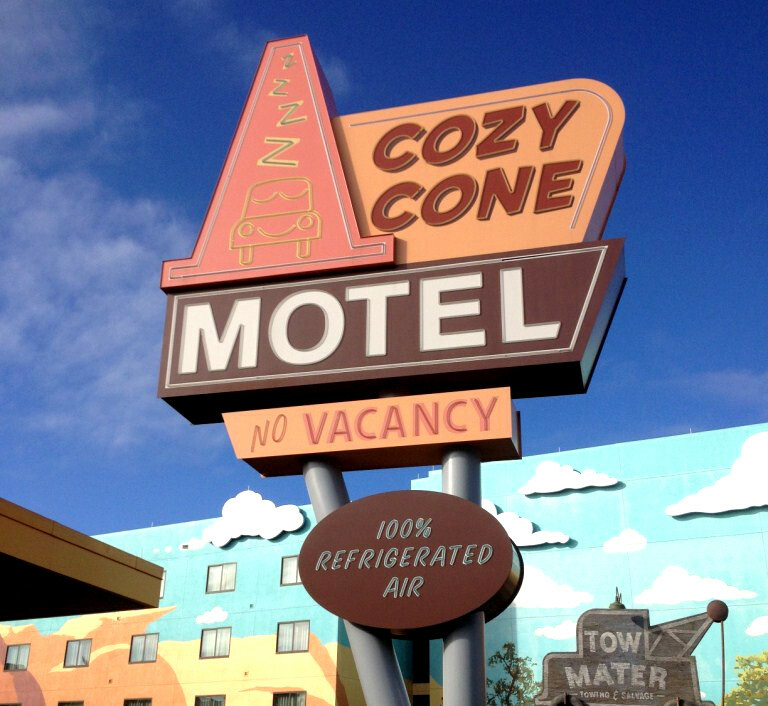 I personally lean towards saving the money and having the extra beds, but LOTS of people want the living room area and other amenities at Art of Animation. 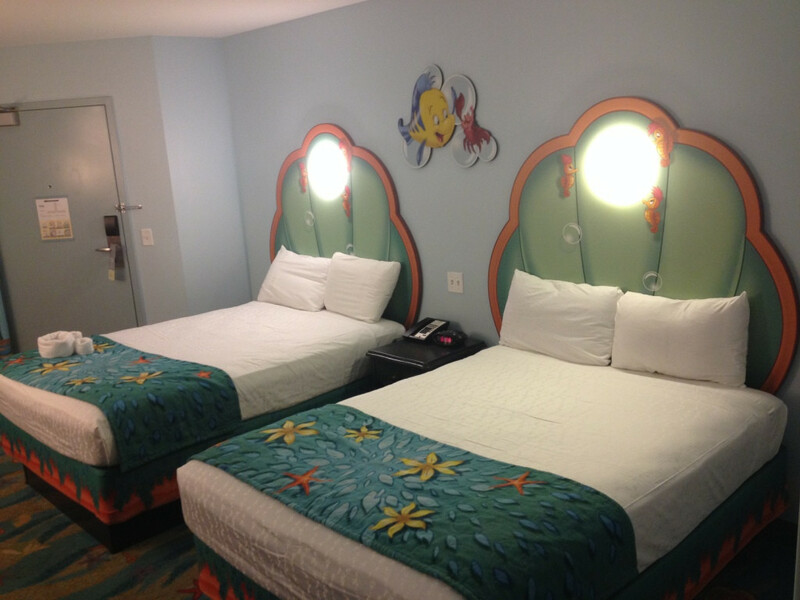 In addition to the family suites, there are also standard hotel rooms at Art of Animation that are themed to The Little Mermaid. 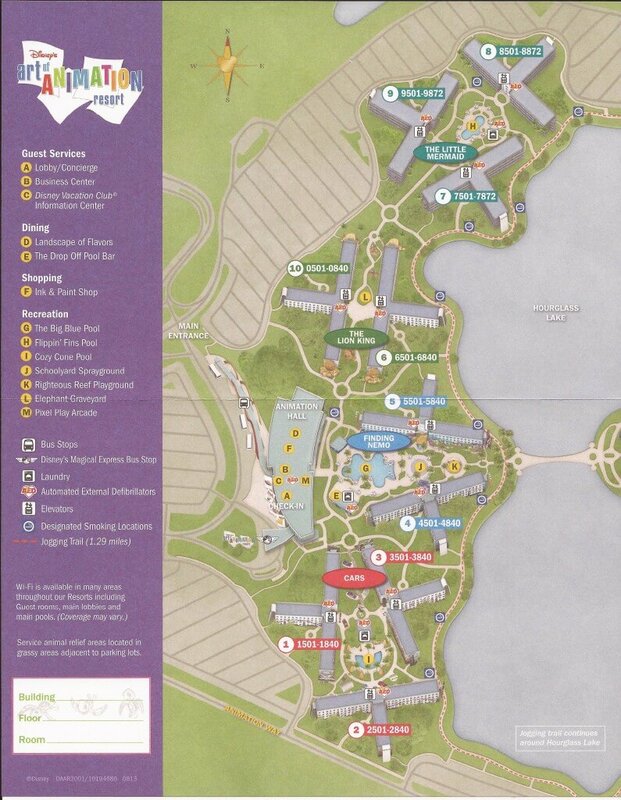 First of all, here is a map with the three buildings in the Little Mermaid section circled. You may notice that they seem pretty far away from the main building, pool, and transportation. And therein lies one major drawback to these rooms – they are at least a 10-minute walk away from everything else at the resort. 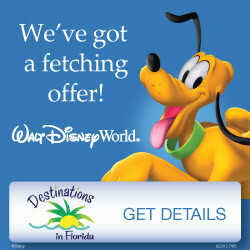 I personally don’t mind walking, and the walk is really fun – past all of the Lion King characters and the nicely themed Little Mermaid pool area. 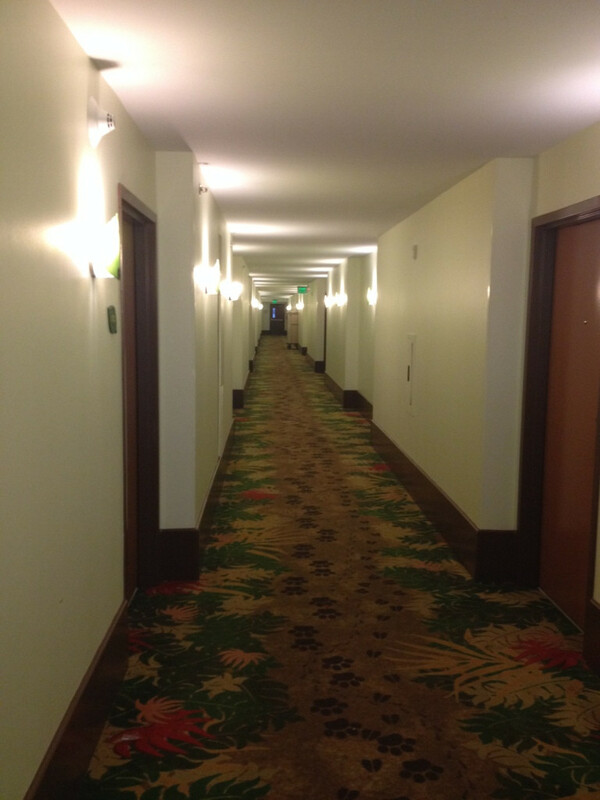 After a long day of walking miles around the parks, however, I can see how folks wouldn’t be excited about an extra half miles back to their room. I would suggest requesting a room close to transportation since that will likely land you as close to the action as possible. For now the rooms contain two double beds. 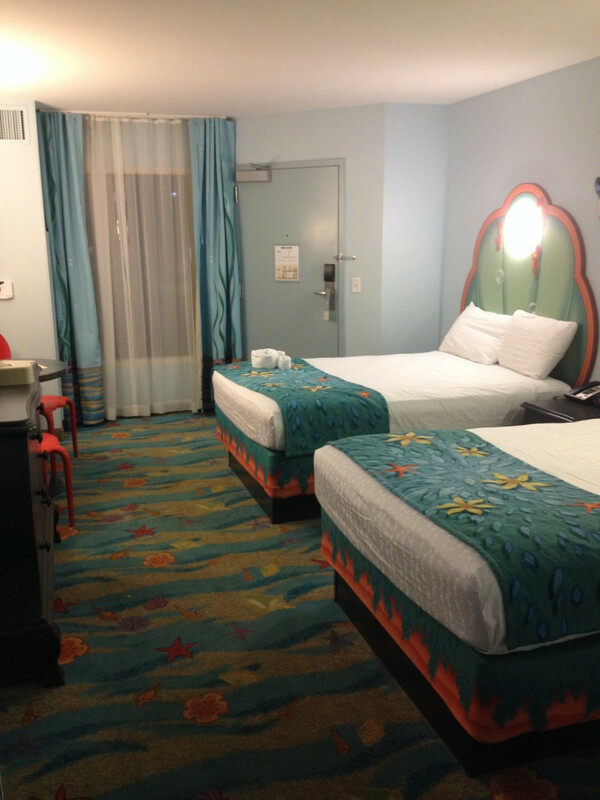 If you are looking for queen beds, you may want to consider Pop Century which was recently refurbished (check out the new rooms here) or a Moderate resort. 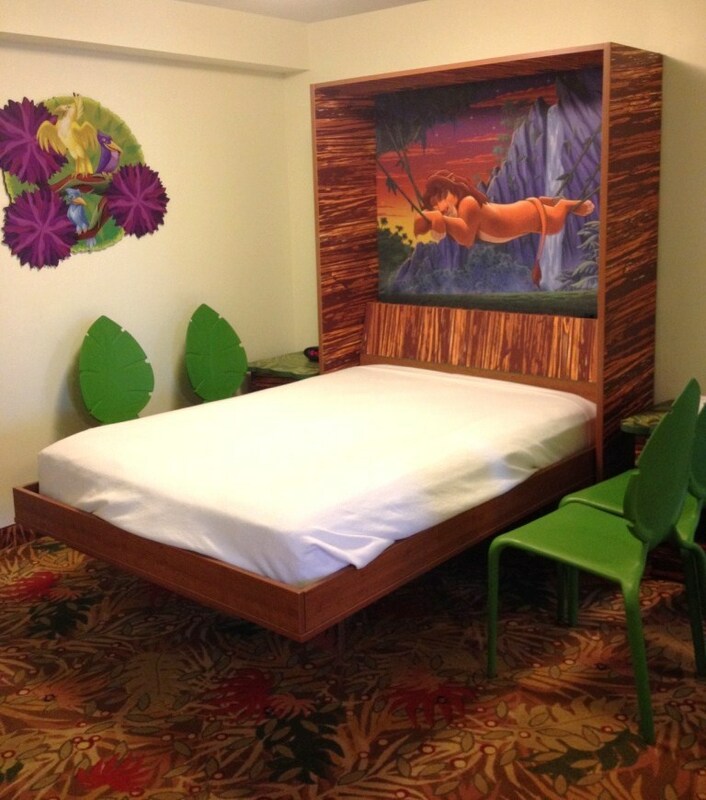 I think the stand out feature of the room is how well it is themed around the story of The Little Mermaid. I will admit that at first, I found the theming to be a little over-the-top. 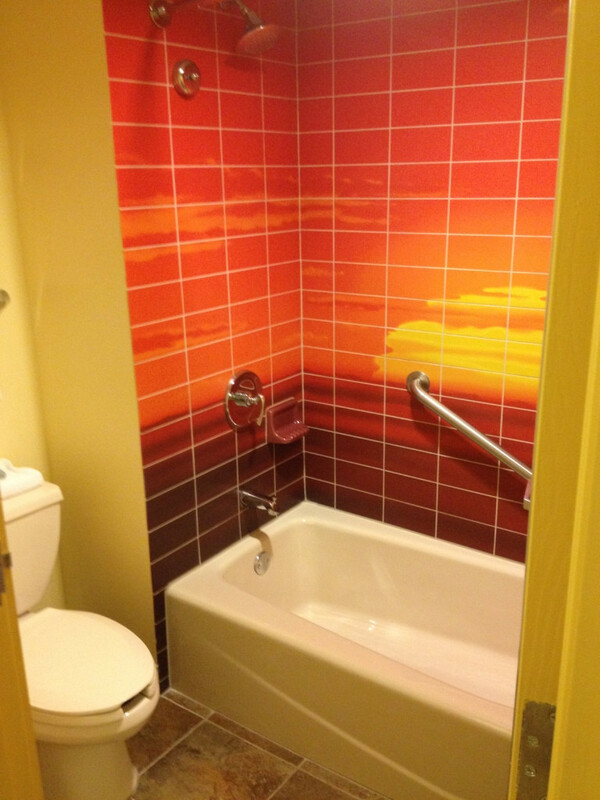 Everything from the carpet to the shower tiles includes under-the-sea-details. You had better like the movie since it kind of looks like it threw up in here. But to be fair, the room really grew on me after a few days. What I found garish at first later seemed fun and fantastic. So maybe it just depends on your attitude or how long you’ve been on vacation. 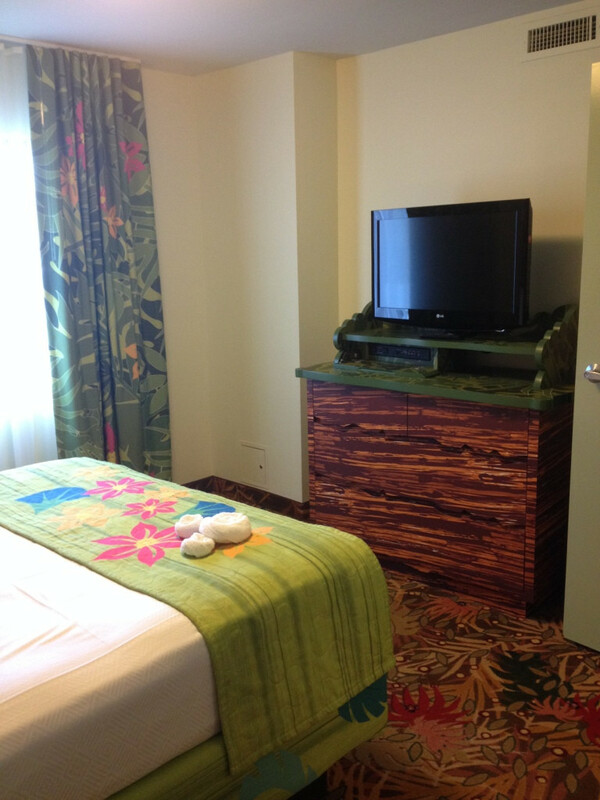 The room includes a small table with two chairs, a flat-screen TV and plenty of drawer space. I particularly like how the dresser looks like an undersea chest and the “sheet music” left on the table by Sebastian the crab. The light fixtures are all pretty cute throughout the room as well. The bathroom area can be curtained off from the main part of the room, a feature I find really helpful with young kids in the room. 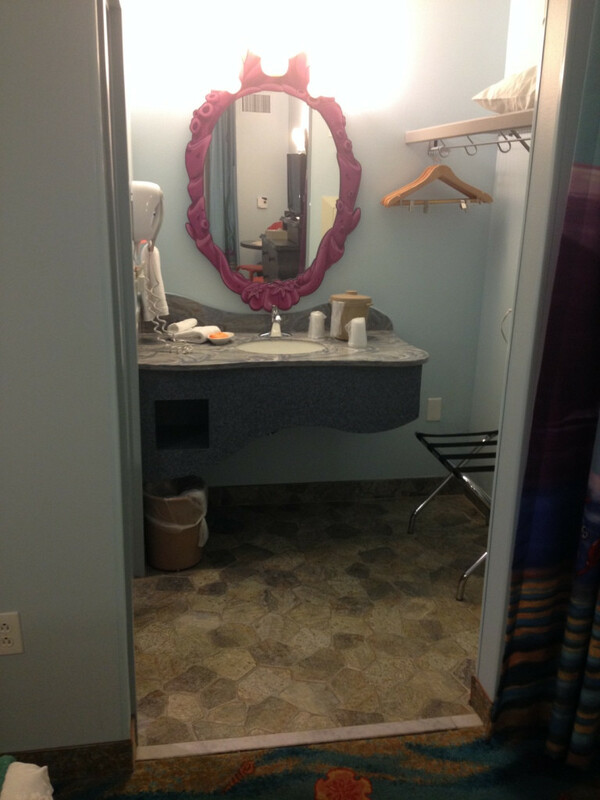 The sink is outside the bathroom proper which contains the toilet and shower. 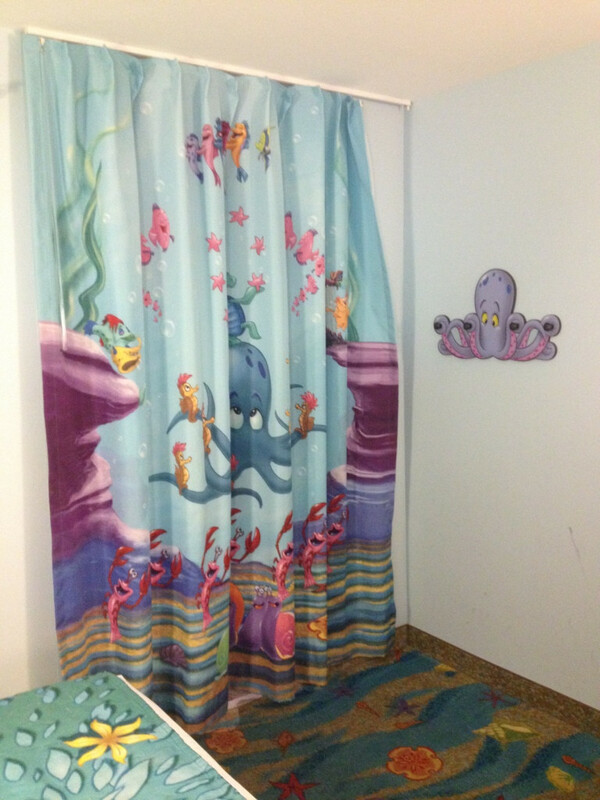 The Ariel shower curtain was my toddler daughter’s favorite feature of the room of course! 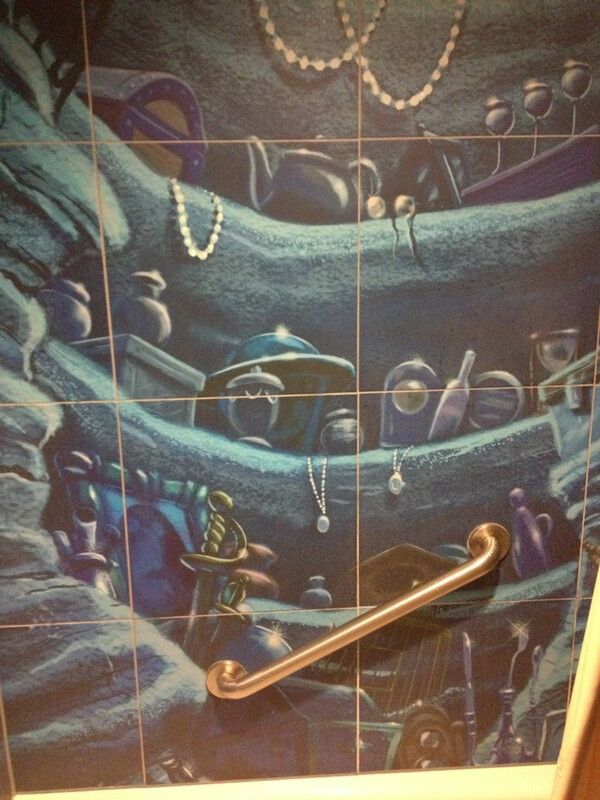 I really liked the floor in the bathroom area as well which is designed to look like something you’d find in Ariel’s own house. This kind of attention to detail is what makes Disney awesome! 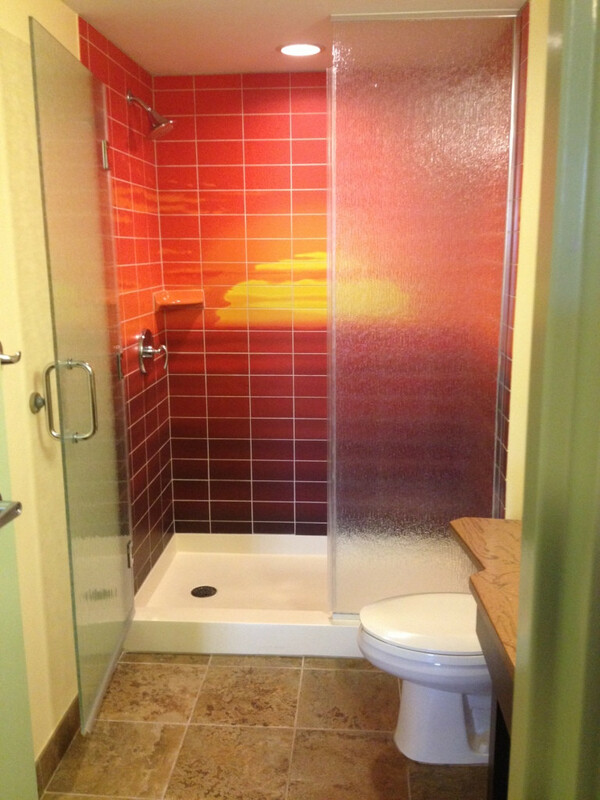 Speaking of details, the tiles in the tub/shower are my favorite part of the room! I can’t tell you how many times I watched the Little Mermaid as a kid (we wore out the VHS tape I think) and I always loved the scenes in Ariel’s grotto. Taking a bath in this tub surrounded by her “treasures” was really fun for me! 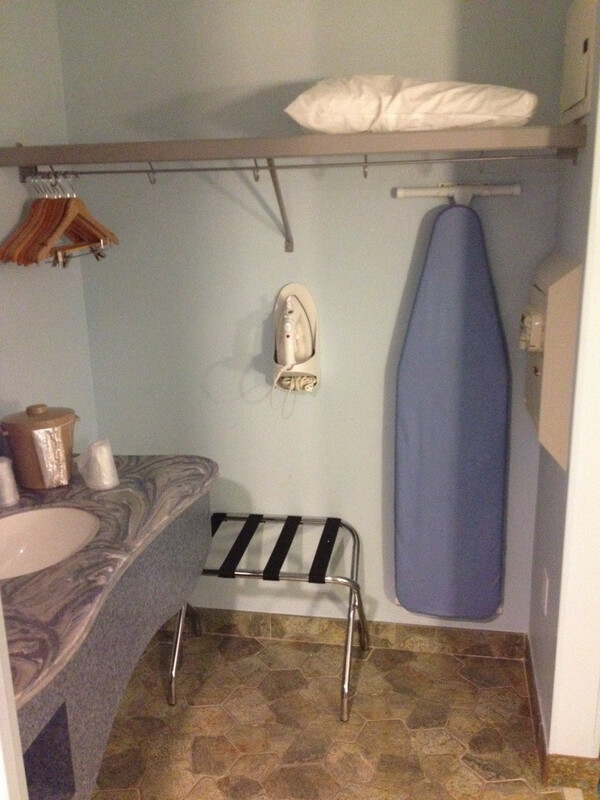 And last, here are some of the other items you’ll find in these rooms: a hair dryer, iron, ironing board, and mini safe. You will notably not find a coffee maker, so I suggest bringing a little pod-style coffee maker from home if you need java first thing… I found one at Goodwill for $3! 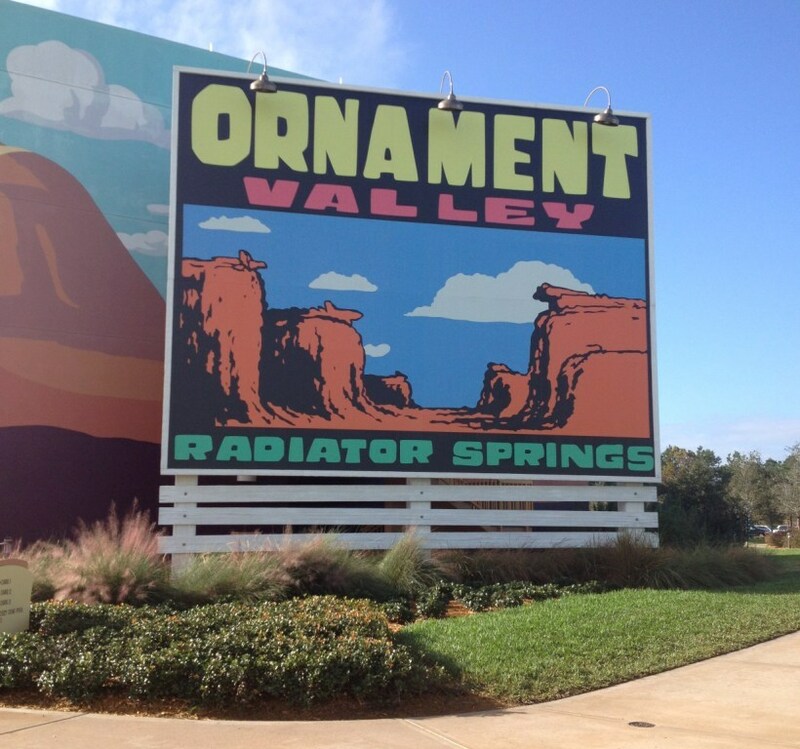 That wraps up this lengthy Disney Art of Animation Resort review! Any questions? 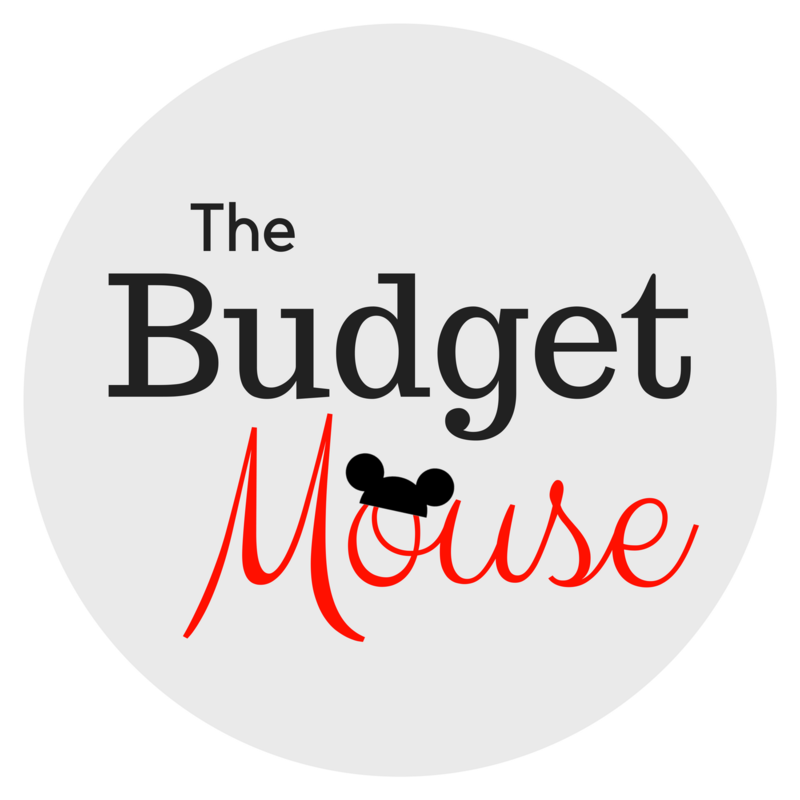 Please leave a comment below or join the discussion in my free private Facebook group!